These are too cute! A perfect way to spruce up your basic pair of stilettos. The designer hails from the Caribbean and has single-handedly solved most of our over packing issues. 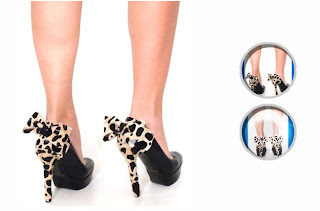 Twenty-three year old entrepreneur Sandrysabel Ortiz from San Juan, Puerto Rico came up with the idea to transform your heels in seconds with The Heel Condoms. Now you can pack your favorite, most comfortable pair of heels with a few heel condoms and leave the other 20 pairs behind. The price range is $20-$39 and can be purchased here. Me gusta!! Simply place the elastic under your foot to keep in place and no one will notice it's there! *When placing condom on heel please be careful, used shoe caps can break the condom. 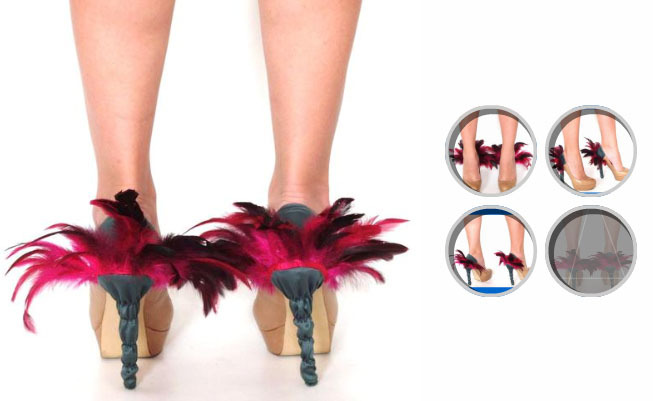 Dark green satin fabric with fuchsia feathers. Beige fur fabric with black leather spots. White leather, animal print fur with thin rope and silver beads. Black suede fabric with gold buttons.